Last weekend we had to go to London to a wedding and so embarked on an alternative Mull journey, taking us into the centre of London and back in 2 days! We really don’t do this every often, but the train made it SO easy. 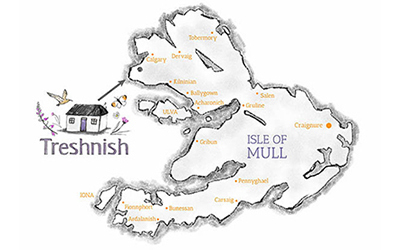 I got to thinking about guests coming to stay on Mull from London and how much easier it would be to come by train than drive! Especially as you can arrange a hire car on the island, and shrink your carbon footprint. We had a couple of meetings to go to in Oban on Friday morning so the alarms were set for an early start! The car was thick with frost and the temperature was hovering around freezing as we drove to the ferry. The sunrise was wonderful. 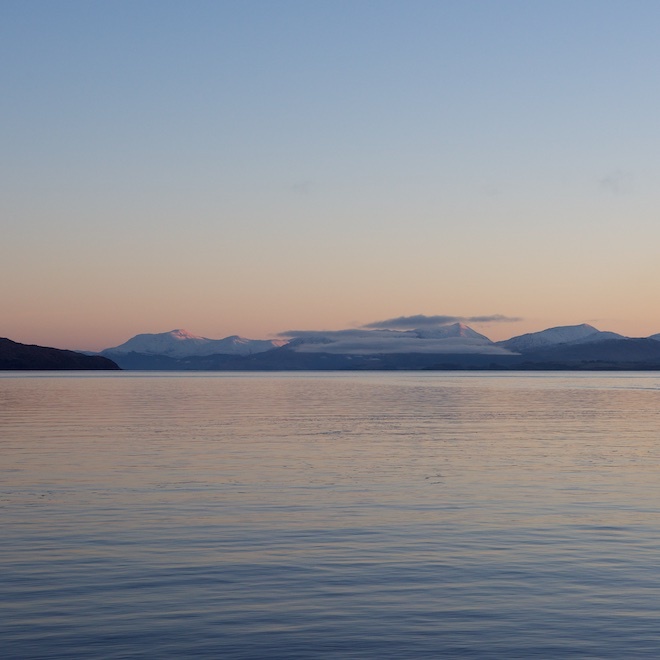 The deck of the ferry was icy but worth it to see the sunrise colours up Loch Linnhe towards Ben Nevis and beyond Lismore to Ben Cruachan. 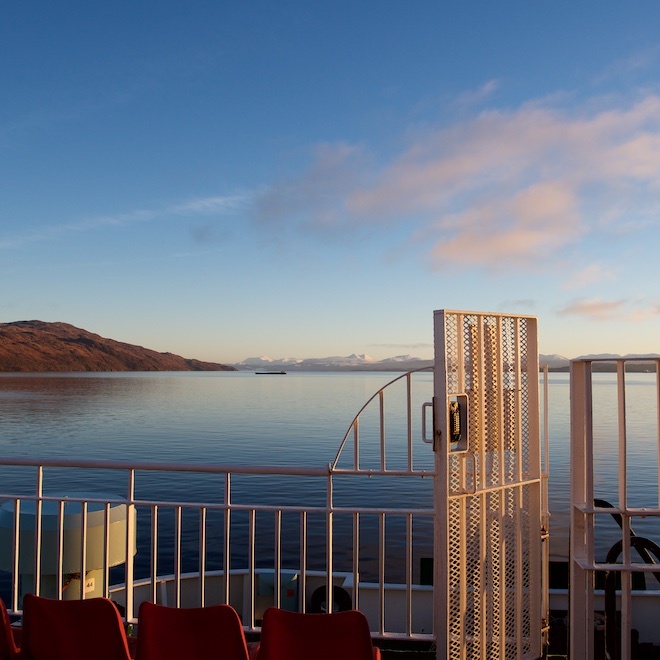 Ferry journeys in the winter are always friendly crossings, lots of catching up with people you haven’t seen for a while! 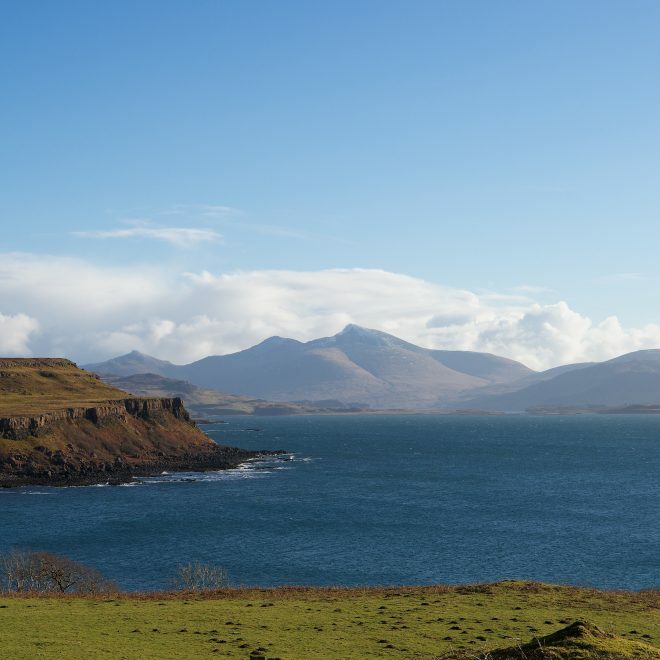 Trips off Mull are always interesting but the drive from Oban to Glasgow that morning was truly beautiful. The sun was shining brightly but the cold temperatures meant the shaded hillsides and forests were still sparkling with heavy frost. 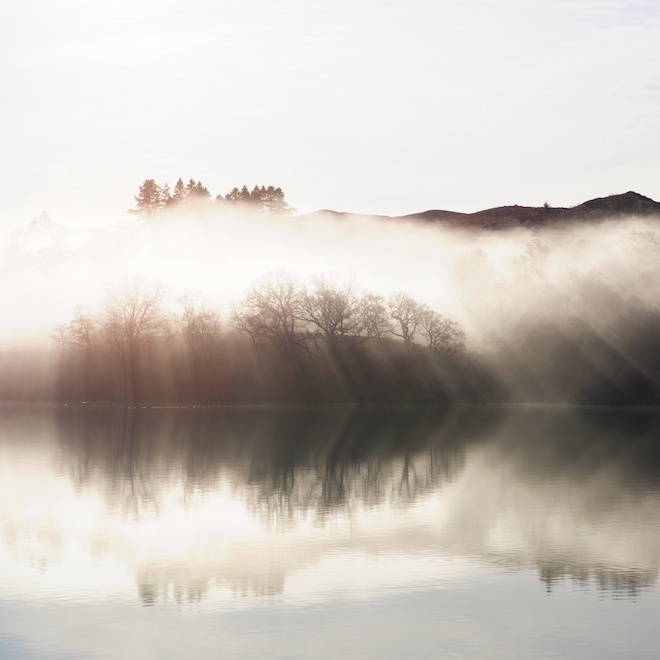 I couldn’t believe my eyes when we reached Loch Awe. We stopped in the Cruachan Power Station car park so I could quickly take a photograph. The light was extraordinary and I could have spent hours photographing it. We always stop at the Real Food Cafe in Tyndrum for a ‘comfort break’! They do good coffee, great food, amazing baking, a gluten free menu and their sourcing is carefully local and ethical. Plus their staff are helpful and friendly – what is not to like! If you buy a Real Food Cafe keep cup, you get a free coffee or tea at the time of purchase and free coffee or tea throughout the year when you re-present the cup. The deal included a muffin and a £2 donation to Toilet Twinning – a charity we support too. Once in Glasgow we parked the car, and headed to our hotel to drop the bags before heading to do our city errands, including an exciting (for us) trip to the Apple Store. I managed to get £60 return tickets to London from Glasgow, without applying a Railcard. A great deal but a very early train – at 5.40am! It meant we were in London at 10.10am, having slept most of the way. What an effortless way of getting right in to London! The wedding was wonderful, well worth the journey, and we spent the night in an Airbnb, literally 2 minutes walk from Euston. Our Sunday morning train left at 8.45am. The first train. As we pulled out of Euston, we received a text from Calmac warning us that due to severe gales the 6pm ferry had been cancelled. 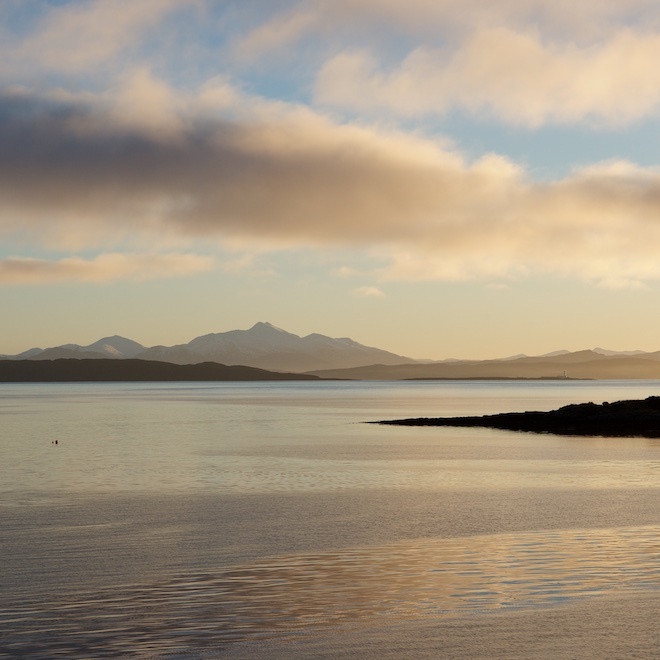 I rebooked us on to the 6.45am ferry on Monday morning (we could have got a later one but had sheep to feed) and booked us a family room at the Oban Bay Hotel for less than £50 – with breakfast! It was good to have advance warning of the cancellation. We were in Glasgow before I had finished reading the latest Peter May novel set on the Isle of Lewis. Picked up the car and headed out on to the road to Loch Lomond. We drove to Oban via the Rest and Be Thankful in pouring rain and once we reached the coast, in gathering wind. A wet, wild and windy walk from the hotel to Piazza for something to eat before turning in. Seaweed blown up on to the pavement and sheets of sea spray blowing through the glow of the street lights. We had a ferry disruption, but it is winter and these things happen. As it was we made the most of it and enjoyed a night out in Oban. And were home by 8.30 next morning! I did a calculation on what we ‘used’ on our journey. Defra figures put car travel at 0.114 CO2/Kg per Km for 1.6 passengers travelling in a petrol car – so about 0.342Co2/Kg per Km for all 3 of us. (Our car is diesel but has a £20 tax disc s0 hopefully better than the average petrol car). Train travel is 0.052 CO2/Kg per Km per passenger so that would be 0.156 Co2/Kg per km for the 3 of us. The train journey ‘cost’ 64.12 CO2/Kg from Glasgow to London plus 32 Co/Kg by car from Oban to Glasgow. Total of approximately 96.12 CO2/Kg. If we had done the Oban to Glasgow bit by train it would have saved 17 Co2/Kg (over 50%). All numbers are approximate and subject to my terrible maths.